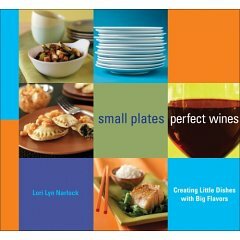 Wine Blog » Blog Archive » Kendall-Jackson’s “small plates perfect wines” is a perfect cookbook! Kendall-Jackson’s “small plates perfect wines” is a perfect cookbook! Honestly, when I heard that Kendall-Jackson has a new cookbook, I had the natural assumption that the book would have a heavy Kendall-Jackson wine focus. I couldn’t have been more wrong. This delightful, brilliantly colorful food and wine book is completely self-effacing, to K-J’s credit. Photographic food styling is very tastefully executed, photography is absolutely gorgeous in minimally clean presentations, and recipes are this side of perfect. In today’s hustle-bustle world, it’s great to know how easy it is to have really flavorful foods without all the fuss our mothers used to endure in the kitchen. That homemaker luxury seems to be gone forever in our modern, two-jobs per household society. I especially love pages 8 through 11: Wine Varietals and Small-Plates Pairings at a Glance. Each cultivar has a Profile in flavor and Best matches suggestions with page numbers. It’s hard to get lost in this book, while luscious flavors are continuously being found. For instance, scallops on blood orange and watercress suggests Sauvignon Blanc as its wine complement. Small Plates, Perfect Wines is produced by Andrews McMeel Publishing, and is now on bookstore shelves and available through Kendall-Jackson to order online. It’s just so appropriate for today’s multi-tasking, on-the-fly lifestyle. I’m hooked. I raised three daughters with wok cooking: clean, wholesome, and flavorful. Now, I’ve got three excellent adult cooks on my hands, and I’m not willing to give up my copy. I’m headed over to the K-J tasting room to buy three more!